Sanjeev was living what the majority would call the ‘graduate dream’, working in Dubai for one of the biggest professional services companies in the world. But 11 months into his job, Sanjeev Sandhu realised a finance career wasn’t for him. So, he gave up an enviable job in the corporate world to begin his journey of spreading gratitude. The 25-year-old from Swansea, who graduated in BSc Accounting and Financial Management from Loughborough University in 2016, began documenting his journey from the corporate to non-corporate world on Instagram, where he would often make videos and post photos on what he is grateful for. “My aim is to inspire authenticity, leading by example. We are lost, seeking validation and putting filters on ourselves more than ever before. We can learn so much and apply it to our own lives through stories of others. The world of social media is beautiful, when used correctly”, he told Asian Voice. Sanjeev recalls the day he realised that his finance job in Dubai was not for him “I looked around my team of 50 and thought I do not have the same professional aspirations as these so how can I thrive there?”. Then at the time of 24, he decided he was in a great position to explore and take risks to discover his passion and discovered his unique selling point: listening and speaking. His Instagram page ‘Sanjeev Sandhu’ has a following of over 2,000 with people from different parts of the world digitally connecting as a positive space to express happiness and gratitude. The 10 day ‘gratitude bonanza’ at the start of every month has proved a real hit with his followers. Almudena Díaz from Madrid Spain, a follower of his page says “getting to know Sanjeev and his gratitude bonanza, has opened my eyes to daily gifts that I was already taking for granted. It has reminded me there are always reasons to smile and be thankful for, being the start of a daily journey”. She is one of the many to have benefited from Sanjeev, who has also helped many with personal struggles from depression to self-love. Once he discovered his purpose in life and doing something which truly made him happy, in 2018 Sanjeev kick started his career by speaking about the importance of goal setting at the University of Wollongong (Dubai), and Impact Hub - an entrepreneur’s club in Dubai. He soon found himself mentoring a range of clients on interview prepping, life guidance, seeking employment in the corporate world and much more. 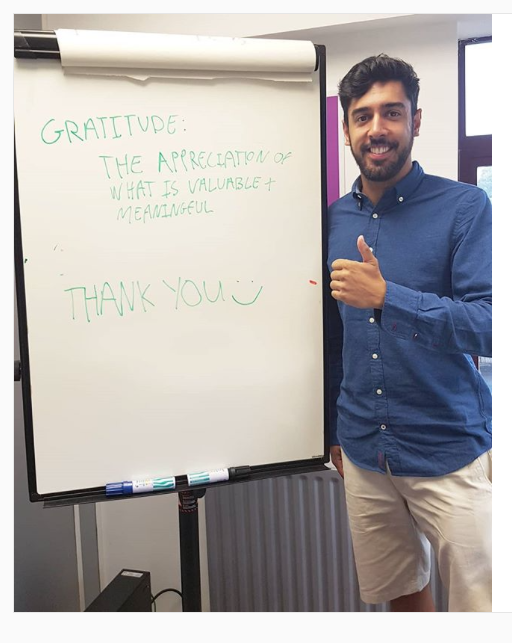 Things really began changing for Sanjeev when he took part in a 21-day challenge with Happiness Co, “my life changed completely after this, and after a few weeks I handed in my notice and plunged myself into the unknown – knowing that if I embrace the uncertainty and strive to provide value to others, the possibilities are limitless”. “The gratitude shared from so many countries, is one of my proudest achievements. I am now working with brands such as Pizza Pilgrim, Honest Burgers and Tea Tulia to promote mental health and gratitude”, he told Asian Voice. Sanjeev will now be setting of on a three-month travel journey to the UAE, India and Australia to work with a variety of students and professions on gratitude and mental health. “Over the next three months I will be immersed in new learning to share more about how to live a happier and healthier life”, he told the newsweekly. To see the professional work and story of Sanjeev visit his website at https://www.sanjeevssandhu.comand to see the gratitude expressed by himself and others visit @sanjeevssandhu on Instagram.